Here is another dessert I made recently that was also a big hit. 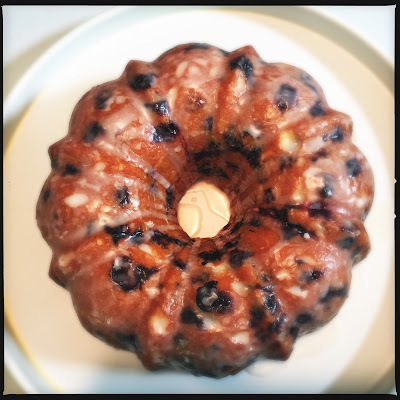 I made some food to take to the lake cabin for July 4th weekend....sesame soba noodles, curried chicken salad, and this blueberry-lemon pound cake. This is a very moist cake, so it's best eaten within a day or two. Also, I highly recommend baking it in a bundt pan instead of a regular cake pan. The first time I made it, in a round cake pan, the middle just didn't quite set before the rest started to burn. You could also divide the batter between 2 loaf pans. Preheat oven to 350°. Grease and flour a 10-in. bundt pan. In the bowl of a stand mixer, mix the butter, cream cheese and sugar until blended. Add eggs and egg white, one at a time, beating well after each addition. Beat in lemon peel and vanilla. 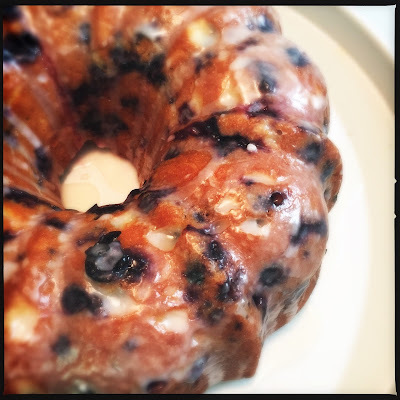 In a small bowl, toss the blueberries with 2 tablespoons flour. In another bowl, mix the remaining flour with baking powder, baking soda and salt; add to the butter mixture alternately with yogurt, beating after each addition just until combined. Fold in blueberries. Transfer the batter to prepared pan. Bake 55-60 minutes or until a toothpick inserted in center comes out clean. Cool in pan 10 minutes before removing to wire rack; cool completely. To make the glaze: In a small bowl, mix confectioners' sugar and lemon juice until smooth. Drizzle over cooled cake. What in the holy he...! That looks divine! I need this!